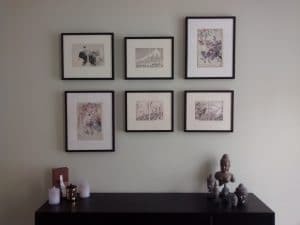 The Picture Hanger - Professional Picture, Art and Mirror Hanging. 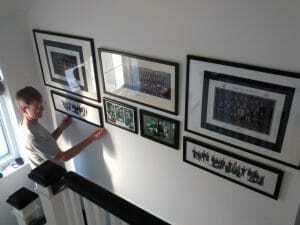 Patrick Donohoe and his team of friendly installers provide a professional picture, artwork and mirror hanging service. 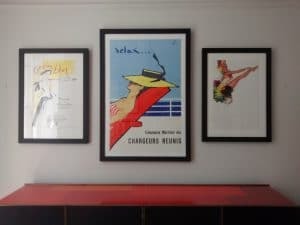 With over 20 years of experience we work in residential and commercial properties across the UK, arranging and hanging anything from single artworks and mirrors, to entire photo walls and whole properties. 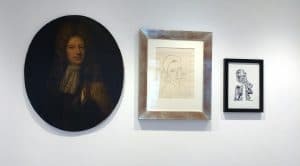 As testament to our level of expertise, in 2018 we attended 671 jobs and hung 7581 pictures, photographs, artworks and mirrors! 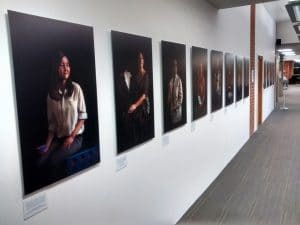 Patrick and Emily did a great job – taking what seemed to me to be a large, random collection of pictures, painting, photos and mirrors and making sense of them all in one day. 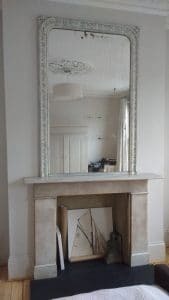 Having just had all my walls newly plastered and painted, I was keen to have a professional service and I was not disappointed. 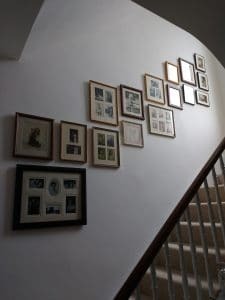 I was consulted along the way and the end result was even better than I had imagined, even down to the family and friends wall collage which is an art installation in itself. I am a very happy customer. 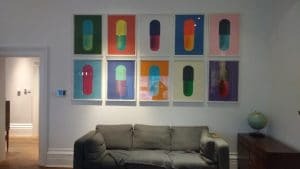 As practising artists and craftspeople we at The Picture Hanger bring a trained aesthetic eye to our work. 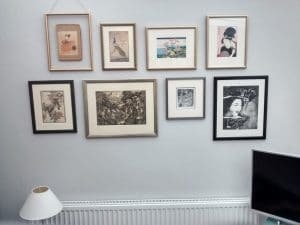 As well as ensuring your work is hung precisely and safely, we can also arrange the pictures, artworks and mirrors throughout your entire home. 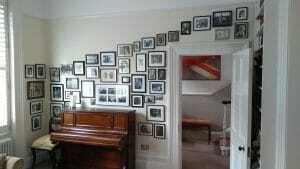 We regularly create inspired picture or photo walls, often from quite disparate and eclectic mixes. 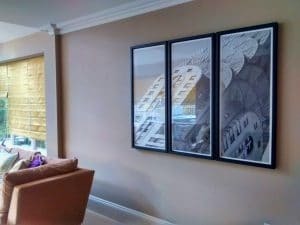 We treat each room as if it were a gallery or an artwork, considering the relationship between the existing artwork in the room as well as the décor and lighting. 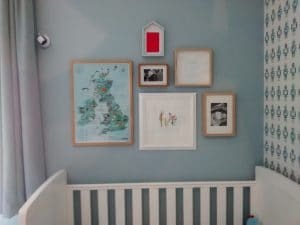 We recently discovered The Picture Hanger and they are fantastic. They are skilled, friendly and professional installers, and we will be using them on all our projects from now on! No job is too large or too small! 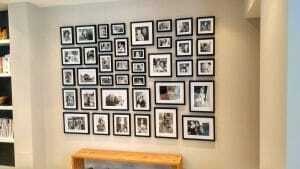 From single pictures or mirrors to entire homes or commercial premises. 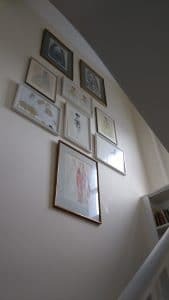 Whether you’ve just moved or renovated & need to rehang everything or have large, heavy or valuable works, we can do it all for you. 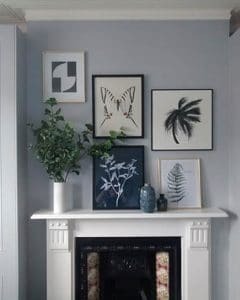 Our friendly team of experienced installers all have an aesthetic eye and can help you decide where your pictures, artwork or mirrors will look best and hang it all for you, quickly and safely. Get in touch to discuss the specifics of your job and we can quickly give you an idea of cost and availability. 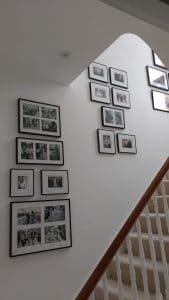 We have just had loads of building work done – took down all the pictures (and hooks!). 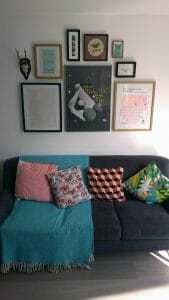 Total inspiration getting the Picture Hanger to come and rehang. 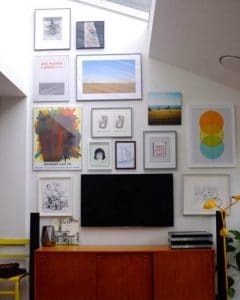 He brought a whole new perspective to where would be best to hang a very eclectic group of pictures! 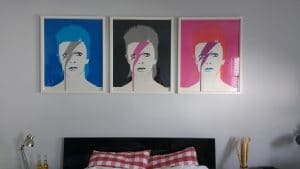 I have used The Picture Hanger on two occasions now and they were terrific. 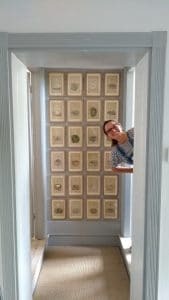 The work was carried out according to plan, diligently, speedily and with good humour in a manner befitting an Artist’s Exhibition. We pride ourselves on being super approachable, down-to-earth and friendly. Our installers are currently based in London, Kent, Sussex and Brighton and we are soon to expand to Bristol, Bath and the South West. 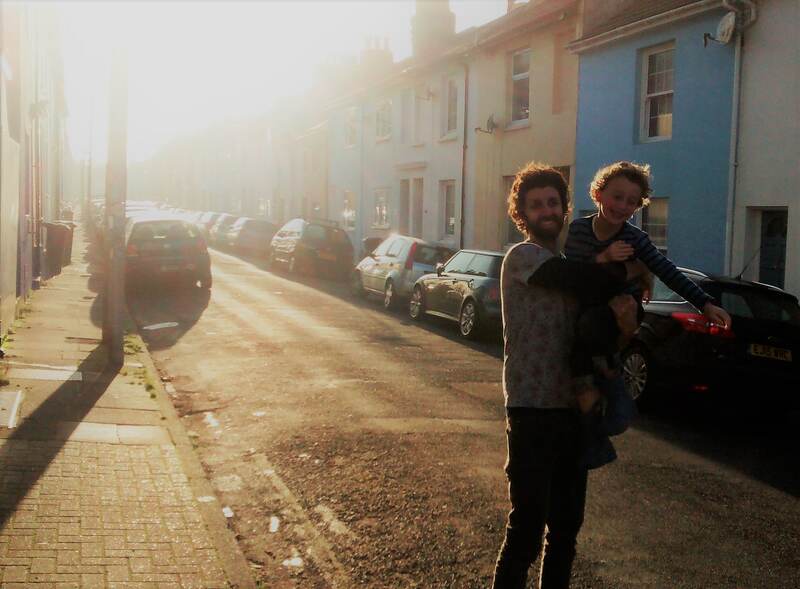 We regularly travel the U.K. to attend jobs big and small. London, Brighton & Hove, East and West Sussex, Surrey, Kent, Essex, Hampshire, Wiltshire, Hertfordshire, Berkshire, Oxfordshire, Bedfordshire, Buckinghamshire. We also often cover the rest of the UK.